With a lightweight ALUXX aluminum frame designed specifically for women, and 27.5 wheels that combine speed, efficiency and control, Tempt can guide you along dirt terrain. A 100 mm suspension fork and powerful hydraulic disc brakes offer added confidence and control. 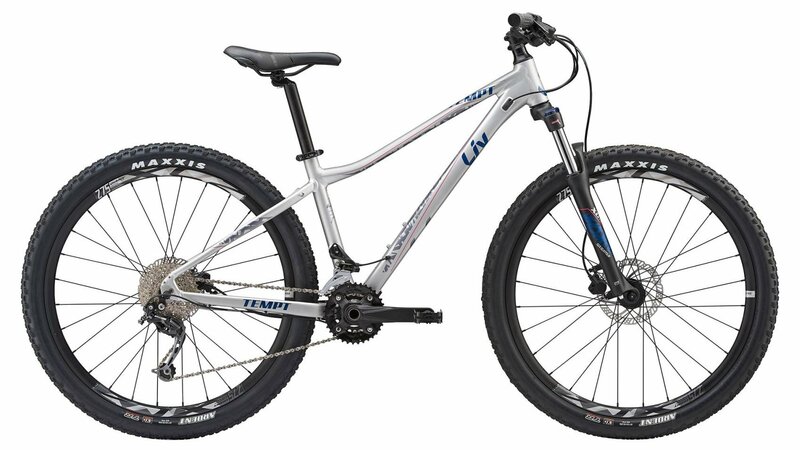 Tempt features all the latest mountain bike trends, with a shorter stem and longer top tube for extra stability and control, and tubeless tires for improved traction. Liv Bicycles are only sold out of our Corona, CA retail store (2410 Wardlow Road, Suite 109, Corona, CA, 92880), or our Riverside Will Call (1615 Eastridge Ave, Riverside, CA 92507). This item cannot be purchased online. If you are interested in a Liv, please contact our Corona Store team at (951) 736-0700, or our Gear Advisors at (888) 880-3811. We are happy to help you arrange a test ride. Are you interested in a Liv model you don’t see on our website? Please let us know - we have access to most Liv models in just 1-2 business days. Thank you for your interest in Liv! SR Suntour suspension fork with 100mm of travel, smooths out trail chatter. Aluxx grade aluminum frame is lightweight and ready to handle anything you can dish out. Durable Giant double-wall alloy rims spin fast and smooth on sealed bearings. Shimano drivetrain with 18-speeds to provide the perfect gear combo.